The Modernist Paperweight is designed by Werkstätte Carl Auböck Vienna exclusively for the Glass House Design Store. 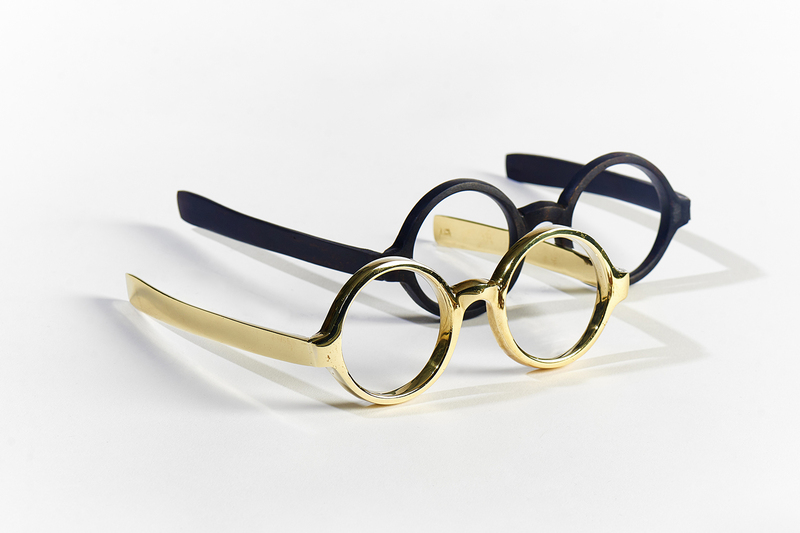 These extraordinary life-sized Philip Johnson spectacles were lovingly created for us by Carl Auböck IV. Each piece bears the official Auböck stamp and comes with exclusive certification. The paperweight comes in patina or polished solid brass options. All purchases help support preservation at the Glass House. 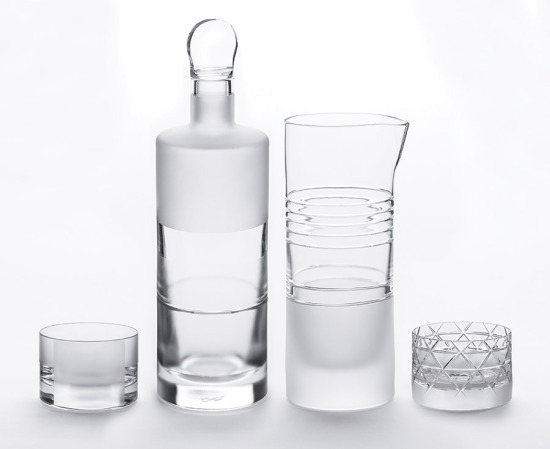 The Glass House Design Store offers an edited selection of gifts and limited editions that represent the sensibility and ideas that inform the Glass House, both the iconic 1949 structure and the unique synthesis of art, architecture, and landscape that developed over half a century. Inspired by “Machine Art,” a legendary exhibition organized by Philip Johnson for the Museum of Modern Art in 1934, the Glass House Design Store celebrates Johnson’s curatorial vision through its rigorous offering. The store is located at the Glass House Visitor Center in New Canaan, Connecticut. The Glass House, built between 1949 and 1995 by architect Philip Johnson, is a National Trust Historic Site located in New Canaan, CT. The pastoral 49-acre landscape comprises fourteen structures, including the Glass House (1949), and features a permanent collection of 20th-century painting and sculpture, along with temporary exhibitions. The tour season runs from May to November and advance reservations are required. For more information, and to purchase tickets, visit www.philipjohnsonglasshouse.org. 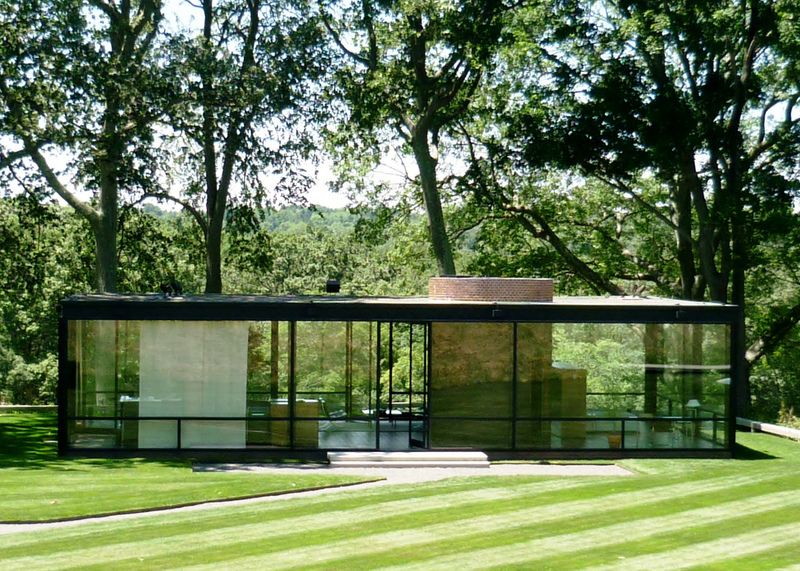 Philip Johnson’s property in New Canaan, Connecticut, is synonymous with his iconic Glass House, but the Sculpture Gallery of 1970 is worthy of pilgrimage itself. “This is still the single best room that I have ever designed,” Johnson said of the gallery in a 1991 interview for the National Trust for Historic Preservation. The Architect’s Newspaper: You have had a varied career as a gallery owner, curator, writer, and museum director. How did you get started in these various activities? Henry Urbach: It began while I was a graduate student at Princeton and I started to take note of experimental architecture as a form of cultural production that is compelling on its own terms. There were many interesting projects but few spaces dedicated to exhibiting them. That was the genesis of Henry Urbach Architecture, which opened to the public in 1997. I wanted to create a new platform for experimental architecture by making use of the gallery model. The gallery was a calling, and a bit of a stretch. I had no gallery experience and no money, but a lot of determination and, slowly but surely, people who got behind the idea, as artists and architects, as audience and patrons, and there was tremendous press support. I think I was very lucky. You became a curator of architecture before it became a fashionable career. Why did it occur to you to become active in this field? As the gallery’s profile grew I developed relationships with curators and institutions worldwide. SFMOMA approached me at the perfect moment, about ten years into the life of the gallery and at a time when real estate and other costs were skyrocketing in New York. The museum offered a wonderful platform to continue exhibiting work, developing new commissions, and, in general, exploring what it means to present architecture. Curating has become professionalized in the past few years with university graduate programs devoted to it and many young people looking to it as a career. What do you think of these recent developments in the art and architecture world? I think it’s wonderful that there’s this kind of interest, and now opportunities, for formal education. Curating in architecture used to be something of a gentleman’s sport or sideline; it deserves to be treated as a proper discipline with its own history, theory, and practices. I remember the show of Lebbeus Woods and Kiki Smith. What other shows did you curate at the gallery that were memorable? We did over 55 exhibitions, so it’s a hard question for me to answer! Some of the other memorable installations by architects include LOT-EK’s Mixer, Freecell Architecture’s MoistSCAPE, and R&Sie’s Mosquito Bottleneck. Did you close the gallery when you moved to San Francisco? Why have architecture galleries devoted to drawings and professional work always had a hard time succeeding as businesses? I closed the gallery shortly before moving to San Francisco. The market for architecture, especially more experimental and contemporary work, remains very limited. How long were you in San Francisco, and what shows did you curate there that stand out? My first exhibition was the global premiere of Olafur Eliasson’s BMW Art Car, made of steel and ice and exhibited in a walk-in freezer. We did Jürgen Mayer’s first museum exhibition, as well as Tobias Wong’s. The largest exhibition was a collaboration with Diller Scofidio + Renfro called How Wine Became Modern: Design + Wine 1976 to Now. There were also shows dealing with the permanent collection through thematic probes, such as an exhibition on the architectural section, one on the process of building a museum collection, and one on the body and architecture called Sensate that included new commissions by Andrew Kudless and Alex Schweder. In 2012 you became director of The Glass House in New Canaan, Connecticut. 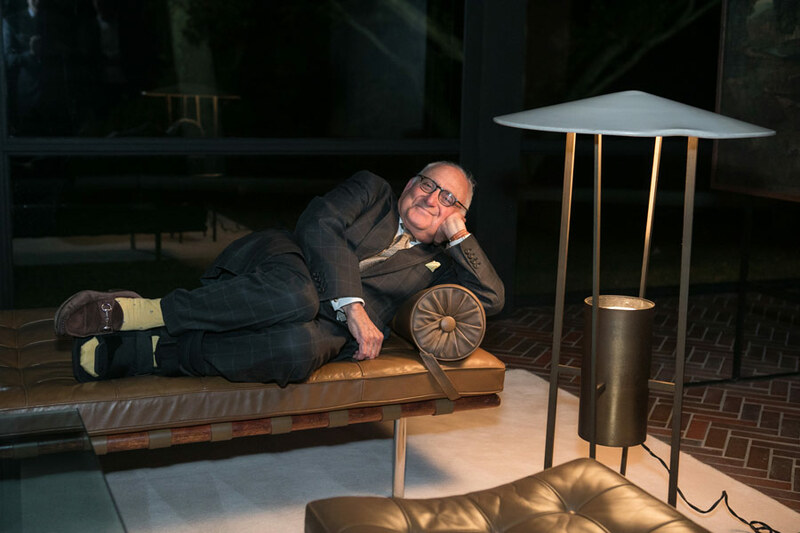 It seems like most of your shows there brought artists to create a conversation with the house and even Philip Johnson’s legacy. How would you describe your mandate for programming at The Glass House? You’re absolutely right. The idea was to take the historic site and transform it into a new platform for contemporary work by artists and architects that could develop compelling dialogues with the house and its author. The most elaborate of these was Fujiko Nakaya’s Veil, which produced a billowing cloud of mist that allowed The Glass House to occasionally disappear. What will you do for your next act? Currently I’m on sabbatical in Tel Aviv, where I’ve been exploring the lively art and design scene while working on several writing projects. Starting in August, I’ll begin teaching a seminar and studio at Bezalel Academy of Art and Design in Jerusalem. Starting January 17, Hilary Lewis, a scholar of Philip Johnson in addition to her work as an author, journalist, and curator, will be the Glass House chief curator and creative director. In her work, she has focused specifically on Philip Johnson for over 20 years, collaborating with the architect in 1992 and then spending a decade co-authoring the book Philip Johnson: The Architect in His Own Words and The Architecture of Philip Johnson. As a curator, she developed the show and catalogue Philip Johnson: Architecture + Art and was named the Philip Johnson Scholar at the site in 2007. She most recently served on the Glass House’s advisory council. 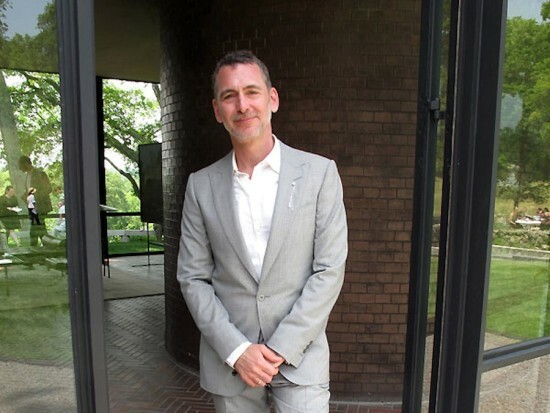 "Having sat side-by-side with Johnson for years, I feel confident that what would honor his and David Whitney's memory most would be for the property to evolve further as a center for the appreciation of architecture, design, and art not just as a museum of Johnson and Whitney's lives in New Canaan," Lewis said in a statement. "It's an honor to have the opportunity to work directly with the Glass House as it looks forward to its second decade of public engagement." The Glass House was built between 1949 and 1995 and is a National Trust Historic site located on 49-acres in New Canaan, Connecticut. In addition to the house itself, the property boasts sculptures and a permanent collection of 20th-century painting and sculpture as well as temporary exhibitions. 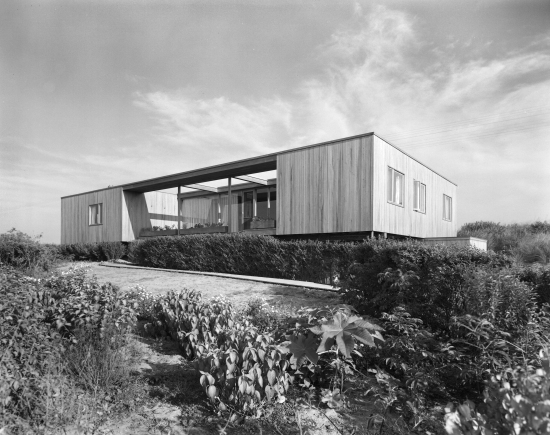 "Hilary Lewis has influenced the Glass House site since its inception as a public museum. She will be a great addition to a great team. I look forward to her continuing contributions in programming content, visitation alternatives, site interpretation and team management,” said Gregory Sages, executive director at the Glass House. For more information and to learn more about its hours and tour season, check out its website. First came the giant pumpkin. Next, the floating spheres. Now, artist Yayoi Kusama has speckled the Glass House with vivid vermillion polka dots. Although Fujiko Nakayaam covered it in fog, and Julianna Barwick bathed it in ambient sound, Kusama’s Dots Obsession – Alive, Seeking for Eternal Hope is the first piece to engage the surfaces of Philip Johnson's modernist New Canaan home directly. Bright red dots of varying sizes are pasted onto the Glass House's walls, playfully disrupting the structure's rigid geometries and distorting its regular patterns of light and shadow to create an "infinity room." “My desire is to measure and to make order of the infinite, unbounded universe from my own position within it, with polka dots. In exploring this, the single dot is my own life, and I am a single particle amongst billions. I work with the principal themes of infinity, self-image, and compulsive repetition in objects and forms, such as the steel spheres of Narcissus Garden and the mirrored walls I have created,” Kusama explained in a statement. The exhibition dialogues with Kusama's other works on-site. Her six-foot-tall PUMPKIN, installed in 2015, sits atop a hill northeast of the Brick House, where Ellsworth Kelly's Curve II (1973) once lived. 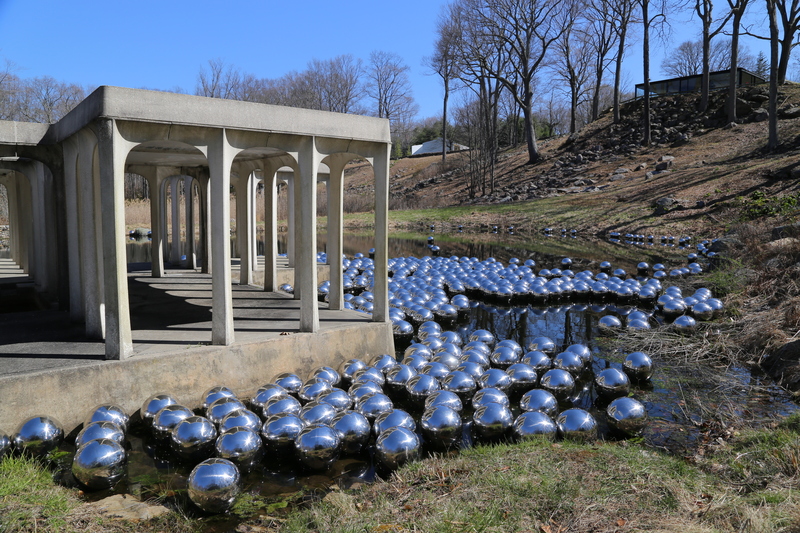 Narcussis Garden, 1,300 12-inch reflective orbs, floats in the property's pond. The installation originally debuted at the 1966 Venice Biennale and was resurrected to celebrate Philip Johnson’s 110th birthday and the 10th anniversary of the Glass House’s public opening. Visitors can buy a sphere (“YOUR NARCISSIUM [sic]”) for two dollars apiece. That installation closes September 7 and Dots Obsession runs through September 26. To see the three pieces together, Kusama fans should drop everything and get to New Canaan soon. 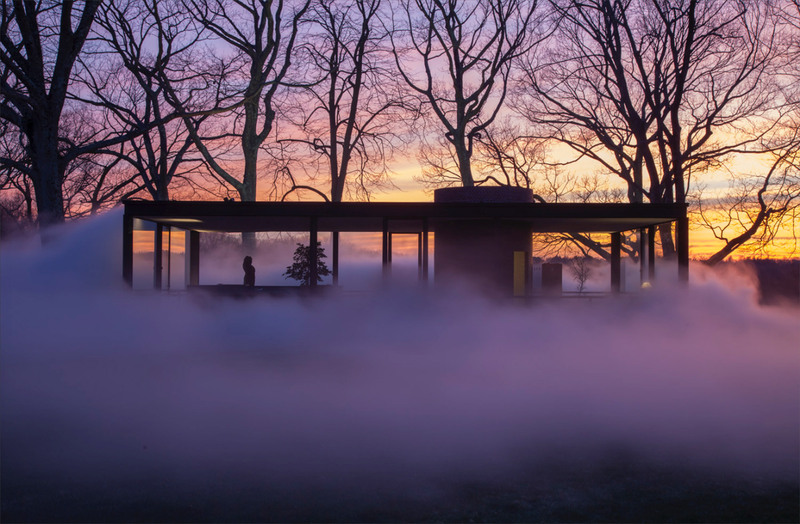 A series of new images showcase the latest installation at Philip Johnson's Glass House in New Canaan, Connecticut. The piece, called Narcissus Garden, is by Japanese artist Yayoi Kusama and consists of 1,300 reflective floating orbs. Narcissus Garden was first created fifty years ago for the 1966 Venice Biennale and it was revived to celebrate both Philip Johnson's 110th birthday and the 10th anniversary of the Glass House's opening to the public. The original installation doubled as a performance art piece, as Kusama sold the spheres for $2 each. The 12" reflective spheres float in a restored pond in the Lower Meadow, next to the Pond Pavilion. The Glass House is also exhibiting Kusama's PUMPKIN, a recent sculpture that will be placed on a hillside meadow northeast of the Brick House. The installation will be on display until September 7. Another Kusama piece called Dots Obsession will run from September 1 through 26, featuring a polka dot covered "infinity room" within the Glass House. 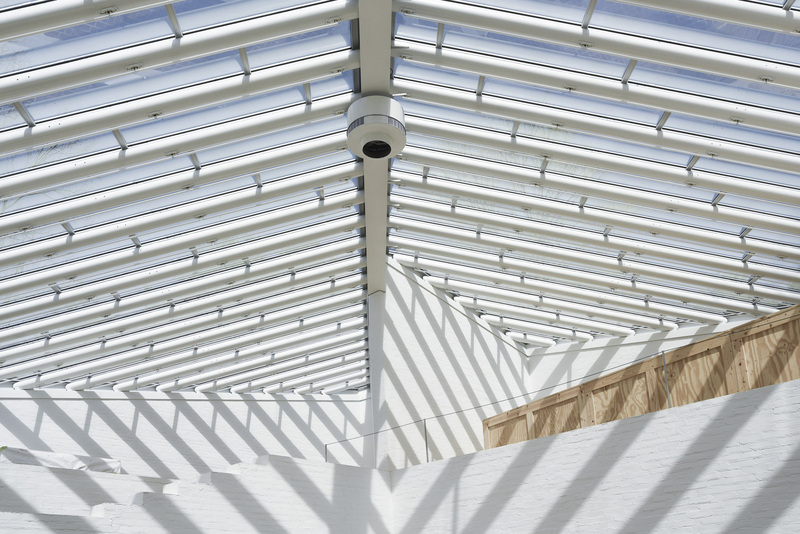 There is a new art installation at the Philip Johnson Glass House in New Canaan, Connecticut opening this Sunday. The exhibit is called Yayoi Kusama: Narcissus Garden and will feature 1,300 giant reflective floating orbs, each 12 inches in diameter. 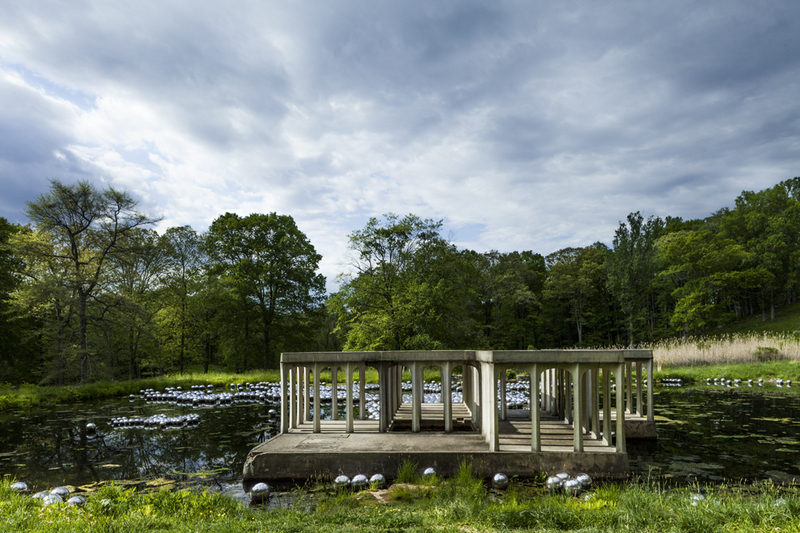 The spheres by avant-garde and minimalist Japanese-born artist (and writer) Yayoi Kusama will float in a restored pond in the lower meadow, part of the 49 acre Glass House property. "We are honored to be working with Yayoi Kusama, an artist Philip Johnson both admired and collected," said Irene Shum, Curator and Collections Manager at the Glass House, in a statement. "This exhibition playfully engages the entire site, creating a celebratory mood for Philip Johnson's 110th birthday and the 10th year since the opening of this museum." Narcissus Garden was originally created and first installed at the 33rd Venice Biennale in 1966, where Kusama sold globes to people walking by her work for $2. She drew people in with two signs hawking "NARCISSUS GARDEN, KUSAMA" and "YOUR NARCISSIUM [sic] FOR SALE." With Kusama's penchant for neon candy colors and bold shapes (often polka dots, which she believes stands in for our souls) her work is said to have influenced Pop artists, including Andy Warhol. The Glass House will also feature two additional Kusama works on site. One is PUMPKIN (2015). "The first time I saw a pumpkin was in a farm in elementary school. In Japanese, a 'pumpkin head' is an ignorant man or a pudgy woman, but for me, I am charmed by its shape, form, and lack of pretension," Kusama said in a statement. The Glass House will host a third Kusama work: Dots Obsession - Alive, Seeking for Eternal Hope, that is set to cover the Glass House in polka dots September 1-26, 2016. "My desire is to measure and to make order of the infinite, unbounded universe from my own position within it, with polka dots. In exploring this, the single dot is my own life, and I am a single particle amongst billions," said Kusama. "I work with the principal themes of infinity, self-image, and compulsive repetition in objects and forms, such as the steel spheres of Narcissus Garden and the mirrored walls I have created." Narcissus Garden will run through November 30, 2016. 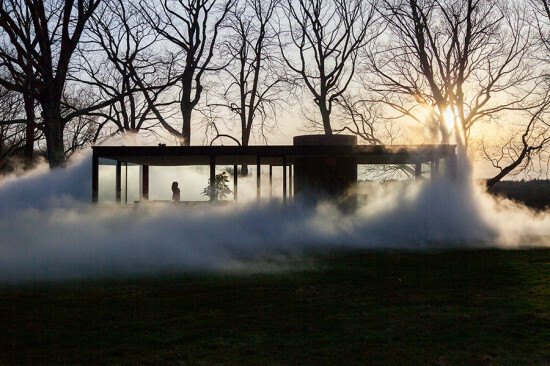 Fujiko Nakaya: Veil Philip Johnson Glass House 199 Elm Street, New Canaan, CT Through November 30 For its 65th anniversary, Philip Johnson’s Glass House in New Canaan, Connecticut, is hosting an exhibition by Fujiko Nakaya that utilizes the historic site itself. Veil shrouds the Glass House as well as the surrounding landscape with fog by running fresh water through high-pressure pumps. The fog will be heavily released then dissipated at set time intervals to obscure the visibility of the area and create a unique experience for visitors. Fujiko Nakaya is well known internationally for her consistent usage of fog in her installations. In 1970, Nakaya created the first-ever fog sculpture by enveloping the Pepsi Pavilion at Expo ’70 in Osaka, Japan, in mist. This exhibition is the first of Nakaya’s works to be displayed on the East Coast in the U.S.